The Austrian Train Set consists of trains from various companies in Austria. Those include the ÖBB, SLB, ZVB and the NÖVOG. Narrow gauge and standard gauge vehicles are included, available from 1911. I even have a train coming next year, 2019, the Talent 3 (4758). I also apologize for the downtime of BaNaNaS caused by the preview versions of this set, formerly called "ÖBB Set". This is not a finished project, not at all. There is a lot more to come and you can keep track of everything other developers and me do on our Discord Server. On that server you can find varying development infos from me and other developers. I also have a Development Thread, but that's not going to be updated as often. If you are a developer and you are interested in contributing, feel free to open a pull request on GitHub with new sprites or new code. But please point out the original author if you are using something you didn't fully make, so we can credit the original author. All of this Content is licensed under GPL v2. Some sprites used in this set are from the 2cc Set or from DACH(2) Set. If you find a Issue, please report it on the Github Issue Tracker. For more Information see here. 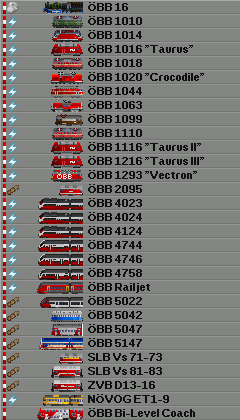 - Change: ÖBB 1044 and ÖBB Railjet got a massive sprite overhaul. - Fix: ÖBB 1063 was able to go 160km/h with 5800kW. Now it goes 100km/h with 2000kW. - Fix: ÖBB 16 had a Capacity of 1 and a Lifetime of 0. This GRF is downloadable over the Ingame Content Downloader, from the attached file to this post or from here. The Nightly Release can be downloaded here. The Source Code of this GRF can be obtained on GitHub. Last edited by PNDA_ on Fri Apr 19, 2019 4:08 pm, edited 4 times in total. looking good at first glance. You have plans for 32bpp edition ? I don't know if you mean either 32bpp (as in colours) or Extra-Zoom Graphics. And also no, I am not planing on either of these, I want to stay at the original style of the game. So I am assuming it means both ? correct me if I am wrong. The 8/32bpp Extrazoom 2cc Set has extrazoom sprites. I do not know if those sprites are drawn in the 32bpp palette or not. I don't seem to be able to find any coaches/trucks with this set - should I be using another set in parallel, or have I got something wrong? This set is a Train Set and therefore there are no trucks included. Also there is 1 coach included in v0.1 and 2 coaches in the newest nightly for v0.2. Also this set is completely independant from other sets, you can use this set by itself. (Though it will display a error that NuTracks is not installed, due to it being recommended for use with this set. It is still usable even after the error message). OK, so I need to use "Austrian Train Set" alongside something else that will give me the rolling stock? If I only have Austrian Trains loaded, I only have locos but nothing for them to pull, but if I load it with, say, DBSet XL, I use those coaches etc. Got it. Is there a preferred set? This is a known Issue. If you download the newest version of the GRF from GitHub this issue will be fixed. (There's also a issue with the ÖBB 1063 fixed in this).